College Professor Comes Forward As Brett Kavanaugh's Accuser: "I Thought He Might Inadvertently Kill Me" - Joe.My.God. California college professor Christine Ford has come forward as the author of the letter accusing Supreme Court nominee Brett Kavanaugh of sexual assault when both of them were in high school. Speaking publicly for the first time, Ford said that one summer in the early 1980s, Kavanaugh and a friend — both “stumbling drunk,” Ford alleges — corralled her into a bedroom during a gathering of teenagers at a house in Montgomery County. While his friend watched, she said, Kavanaugh pinned her to a bed on her back and groped her over her clothes, grinding his body against hers and clumsily attempting to pull off her one-piece bathing suit and the clothing she wore over it. When she tried to scream, she said, he put his hand over her mouth. “I thought he might inadvertently kill me,” said Ford, now a 51-year-old research psychologist in northern California. “He was trying to attack me and remove my clothing.” Ford said she was able to escape when Kavanaugh’s friend and classmate at Georgetown Preparatory School, Mark Judge, jumped on top of them, sending all three tumbling. She said she ran from the room, briefly locked herself in a bathroom and then fled the house. 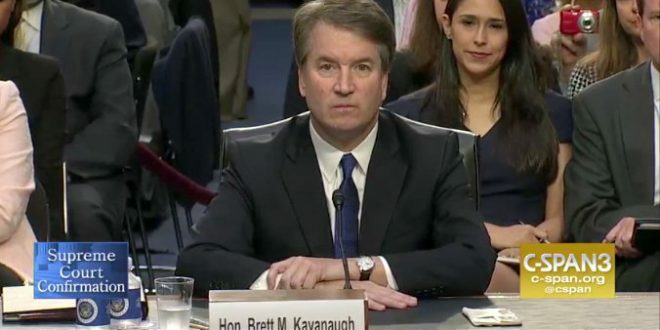 Kavanaugh’s accuser provided the Post 2012 notes from her therapist, who said she had reported she’d been attacked by boys “from an elitist boys’ school” who went on to become “highly respected and high-ranking members of society in Washington.” Kavanaugh’s name wasn’t mentioned.